Progressive Charlestown: Too big or too small? 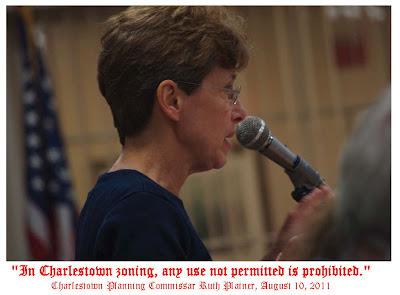 The Charlestown paradox: Onerously detailed ordinances but virtually no way to enforce them. "I'm not in favor of abolishing the government. where we can drown it in the bathtub." It’s an article of faith among Republicans—and the Charlestown Citizens Alliance has sided firmly with them on this issue—that government is “too big” and government spending needs to be cut back drastically. Representative Roscoe Bartlett (R–MD) is such a believer in “limited government” that he doesn’t even think the government should be funding education. Which is kind of an odd thing to say given that much of Charlestown government is run by volunteers. It’s also an odd thing to say when you consider how the CCA jumps on any chance to make taxpayers buy up more land. Plus it’s a fact that Rhode Island’s government has been among the fastest shrinking in the U.S., thanks first to former governor Donald Carcieri’s threats that provoked hundreds of state workers to take early retirement—meaning that we’re now essentially paying former state workers not to work—and the steady state budget cutbacks ever since. Yet Tremblay’s down with the Platner Principle; go figure. Though interestingly enough, a recent Westerly Sun story refers to a 2008 case in which a Superior Court judge ruled that Newport could not use the “prohibited unless permitted” argument to impose penalties on a resident for erecting a home wind turbine. Which makes you wonder how the Planning Commission plans to enforce the principle. The Planning Commission has played a prime role in restricting property rights and pushing government into every home and business in town. With all the microregulation the Planning Commission has inflicted on Charlestown residents, we’d have to at least triple the size of town staff—except that the Planning Commission and Town Council Boss Tom Gentz and Council Vice President “Deputy Dan” Slattery prefer to have enforcement done by vigilantes. Indeed, this paradox lies at the heart of many of our ordinances. The ones written by the Planning Commission in particular are painfully detailed, but then the commissioners fail to get buy-in from the people who’d need to actually enforce them, which, in the case of the dark-sky ordinance, led to the provisions for residential properties being scrapped entirely. Yet the final version of the ordinance, which the council voted in favor of Monday night, restricts the height of light poles on commercial properties to 15 feet, based on no scientific, rational, or logical basis other than Ruth Platner’s threat to hold her breath till her face turned blue if they didn’t. With other ordinances, there’s no provision for enforcement whatsoever, like with the “smoking ban” on town beaches, which in reality is merely a suggestion. It’s symbolic at best, cynical at worst, and ultimately leads to selective enforcement. And yet for all their talk of small government, the CCA cabal was willing—nay, eager—to turn Ninigret Park over to the feds rather than leave our dedicated volunteers on the Parks and Recreation Commission in charge. Indeed, at Monday night’s Town Council meeting, the council voted in favor of Slattery’s (ultimately toothless, completely symbolic, and due to expire in 12 months) Memorandum of Understanding between the town and the U.S. Fish and Wildlife Service. 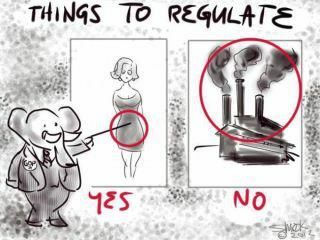 In addition to wanting small government in general, Republicans distrust government bureaucrats and are fond of trumpeting their business experience as a qualification for running the government, claiming that government should be run like a business. But unlike businesses, government exists to serve all of its citizens, not just those who can pay for government services. As former Costco CEO Jim Sinegal stated in his speech at the Democratic National Convention, all businesses rely on the infrastructure that government puts in place, such as transportation, communications, and financial networks. One reason people come here from Third World countries to start businesses is because in their own countries, the infrastructure doesn’t even exist to be able to do so. Well, I have news for them: The government’s been picking winners and losers all along. By subsidizing nuclear power and fossil fuel extraction, they long ago picked those as winners over other energy sources. The government even decides what we eat, via the agricultural subsidies that distort our entire food supply and ultimately contribute to the obesity epidemic by making high-fructose corn syrup so ubiquitous and cheap. Because of course to win the presidency you have to win Iowa, land of that highly subsidized corn. Now we’re even using corn for ethanol, as opposed to Brazil, which uses sugarcane. “We believe in using the tools of government to help Americans help themselves. For instance, programs such as Head Start and the Pell Grants have brightened the futures of countless American young people and given them a hand up into the middle class. Now, Mitt Romney and the Republicans are proposing a budget that would squeeze the life out of Head Start and Pell grants. Without which I would not have been able to attend college at all.